Responses were close to evenly split, with moderately more integrators preferring camera-side motion detection (57%) than server-side (43%). Much of this is due to the tradeoffs to both approaches, which we review below. The most commonly-cited benefit of configuring motion detection on cameras is the reduction of server load. Since motion processing is moved to the edge, more processor is available for other functions. Depending on the VMS, this may allow more cameras to be run on a single server, or a smaller server to be used for the same number of cameras, reducing costs. "There is unused processing power available on the camera end, and that increases the camera density on the server side. We can assign more cameras per server if we keep the motion detection on the camera." "We pay a premium for these cameras because they have intelligence so why not use it. Also, when using the camera for motion detection the server requirements are really low. You can run a lot of cameras on a low powered PC when doing motion detection on the camera side." "Reduced strain on VMS software and computer hardware. 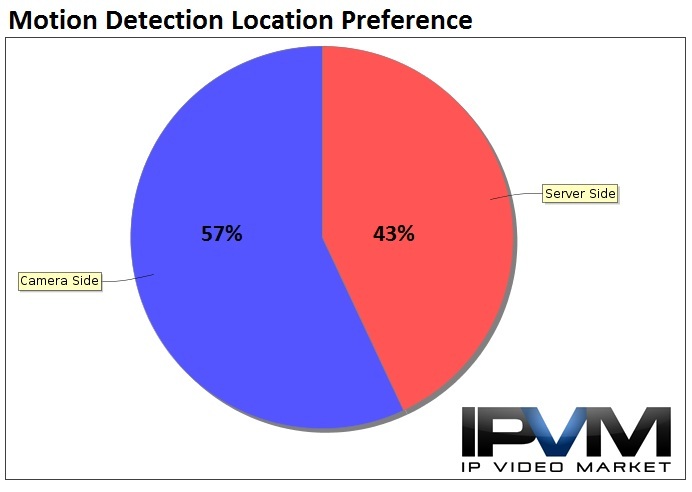 Camera motion detection in IP systems makes the VMS more reliable and reduces strain on the server." "Instead of a large centralised server needing to work hard to process the motion of many cameras, they are done in the field. This adds to reliability and the removal of a single point of failure." Some cameras may be set up to send video frames only when motion is detected. This helps to reduce bandwidth and storage needs, as unnecessary data is not sent. This may cause issues, however, if motion detection zones and thresholds are not properly configured, as the camera may not trigger and send video during actual events. Some users prefer to use motion boost recording because of this, recording low frame rates or bitrate continuously, and increasing upon alarm. Note that motion boost recording is not strictly a camera-side function, but may be used with server-side motion detection, as well, dependent on the VMS. "The camera can reduce the network traffic by streaming at a slower rate on no motion." "When we use cameras that can handle motion alarms I prefer them for minimizing bandwidth use and server processor load when running H.264. Also since we use Milestone, the live disk don't have to work so hard." "Much less load on the network"
"Whenever possible, I prefer the camera to send only those frames where motion has been detected. This tends to reduce overall network bandwidth requirements, still a hot commodity in certain circles." Consistency is the main advantage to server-side motion detection. Regardless of camera type or capabilities, when motion is performed by the VMS, all cameras are configured in the same way. Some VMSs allow motion settings to be copied from camera to camera, as well. Both of these serve to reduce installation time and complexity, since multiple user interfaces need not be learned and managed to set motion detection across multiple camera manufacturers. "It really depends on the bandwidth issues (if any) on the network. If bandwidth is not an issue i prefer server side VMD as it will be consistent across all of the cameras (if there happens to be more than one brand of camera in the system). It is also usually easier to set up as some generic settings can be copies across multiple channels. "Server side for a consistent implementation." "Easier to change on a mass scale. If using motion detection in the camera you have to change it per device which costs time and money." "Server side VMD also get s equal treatment if you do updates. That is to say an update to the VMD in the server software will apply equally to all of the cameras on the system. If you do camera updates and there are different cameras in use you can end up with inconsistent results." "It is easier to set up motion detection within the VMS as you can do it all form one location as opposed to having to remote into each camera individually to configure it." Proponents of both camera- and server-side motion detection may claim retention of settings as a benefit. When camera-side motion detection is used, settings are retained in the case of server failure, limiting the reconfiguration which must be performed. Conversely, should a camera fail, perhaps a more likely occurance, settings may be retained on the server when a new camera is installed. Camera-side: "Camera always. you set it on all cameras, (most VMS's have the setting to set all at once, and fine tune each later), since if the server fries for some matter its just a matter of re-installing the VMS's and never need to recover settings on the cameras." Server-side: "It alleviates having to reconfigure the motion detection settings if a camera is replaced." While cameras fail far more frequently than servers, a server failure is more catastrophic than a camera failure since failing servers will wipe out settings from many cameras. As such, this is hard call that ultimately depends on personal preference. VMSs and cameras support varying numbers and shapes of motion detection zones. Some will support motion boost recording only when motion detection is server-side, while others may allow this capability when using camera-side motion detection. For these reasons, VMS and camera selection will skew preferences for server- or camera-side detection. Camera-side: "With OnSSI the server motion detection is one window with one sensitivity. As we keep going up in Mega Pixels that we are installing one motion windows is not cutting it. We typically use three or four with different sensitivities on 3M cameras alone to minimize false trips." Server-side: "I like running motion detection on the server side because it seems to have more options. Such as being able to do pre and post recording of segments and threshold of blocks off screen." Taking these factors into account, users should be aware that motion detection performance is highly subjective. Due to the number of variables involved, users should test and understand the performance of the platforms they are deploying.